G is for go, go on an adventure. Go on a journey. To a far away land with mystical trees and open seas. Where the grass grows tall and strange animals linger. They sing and they dance and talk to each other. G is for go, go far away pesky little brother. Please leave my room. I have a picnic to attend with my soft bear friend. He sits in his chair, not moving at all, still as a mouse just a bit tall. G is for go, to the cars on the street. They loom and they buzz by everyone they meet. And once in awhile I see a girl wave, quietly from the back seat she’s tucked in her cave. She smiles and whispers something I cannot hear, it must not be important since she is no longer near. 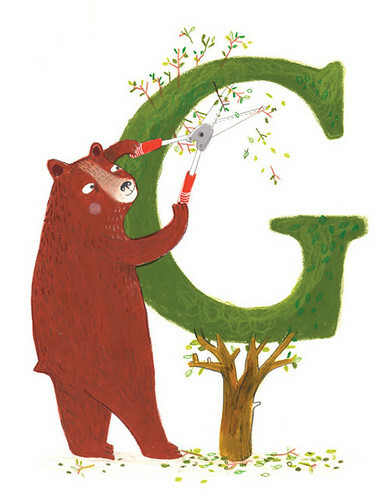 G is for go, “GO TO BED,” my mother says. She shouts it upstairs, like a ball in the house. Bouncing here and there and everywhere. It misses my ears, sails right past my face. Until the next thing I know she’s entered my space. And so I go, I go with a G, off to my bed for little old me. 1. The part of speech that expresses existence, action, or occurrence in most languages. Now it’s your turn! Pick a verb, any old verb, and base a poem or short story around this action word. Don’t forget you can send your submissions to yellowfinchdesigns@yahoo.com for a chance to be featured here on Babiekins Magazine Blog.